You see, Lucas found himself at his lowest point. He remembers sitting in an isolated cell with padded walls. He had nothing but a hole in the floor to use as his restroom. He had nothing but a roll of toilet paper to use as his blanket and pillow. “I found myself contemplating what I was going to do when I got out,” he said. Lucas’ conviction and incarceration slowed his spiraling life down long enough for him to really think about where his current road was taking him. And it was a place he did not want to go. When he was finally free, his grandparents urged him to go to college. And that’s when he sought out Georgia Highlands College. He signed up for classes and plunged headfirst into student life, getting as involved as much as he could. For Lucas, this was a great place for him to start, a place he could make himself thrive within. Students in the group are required to sign a B2B/ GHAME contract that promotes a healthy academic career, including attending all classes, performing community service with the group, and spending time in the tutorial center every week. And once Lucas hit the ground running, he couldn’t stop. He joined Green Highlands, a student group that promotes sustainability and environmental awareness. 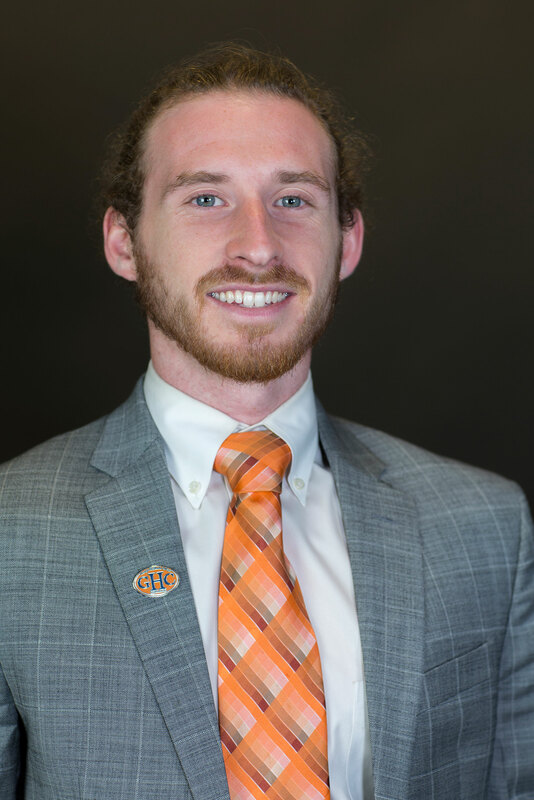 His work with the group has led to the development of a Charger Garden on the Floyd campus that will one day contribute food to GHC’s Charger Food Pantry, which was started in 2016 to meet the needs of food insecurity among college students. In that same time, Lucas joined the Student Government Association and ran for president. He was elected by his peers and served in that role for 2016-17. “All of these activities allowed me to open my mind and think about things in a way that I had previously not considered important,” he said. But the more Lucas moved forward, the more he thought about where he had come from. He soon became very passionate about providing encouragement and assistance to individuals who have been incarcerated, been on probation, and/or had a criminal record. Lucas now works to reach out to people who are coming out of prison and trying to make a new start. Lucas’ decision to change and make his life better has put him on track to earning his associate degree from GHC in political science. Next, he plans to head to West Georgia to get his bachelor’s in philosophy on a pre-law track in preparation for law school. He credits GHC in part for helping him achieve things he never thought he ever could.